Most businesses assert that people are their most valuable asset, but are they realizing the full potential of those people to drive innovation and competitive edge? 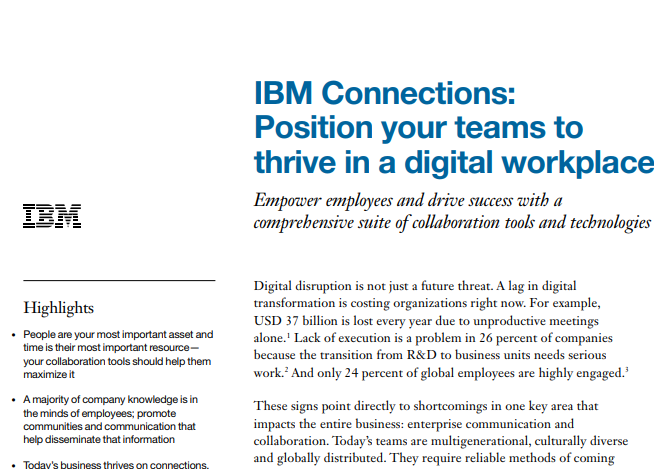 Both teams and organizations are challenged with bringing focused collaboration to everyday work - a challenge that can be met with IBM Connections. How you can boost team productivity. Preview into IBM Connections' unified capabilities and benefits. How our customers use IBM Connections to solve their collaboration challenges. Download the paper today to learn how teams and organizations can be empowered to collaborate more effectively with the people and content that matter most.